My husband watches the grocery store meat section and when they put the ham slice on sale he buys them up and we put them in the freezer. $3.48 down to .65 now that’s a bargain. You can get a vegetable in the meal by adding broccoli to the mac & cheese. 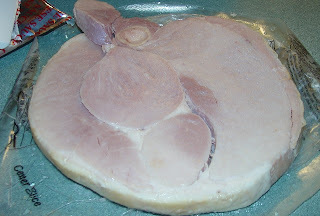 This is the ham slice as it comes out of the plastic. 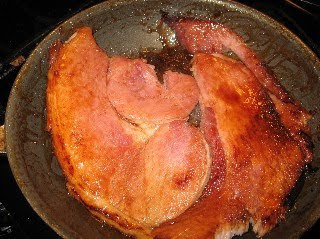 Throw it in a hot pan, flip it a few times till it has a little color and the extra water from ham has evaporated. It’s good to use a pair of tongs to flip the ham. Add a good spoonful of Chipotle jelly. 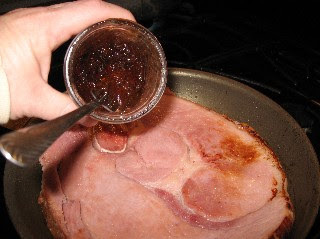 Spread it around, then flip the ham and add jelly to the other side. You should have good color on both sides and jelly should be bubbly in the pan. 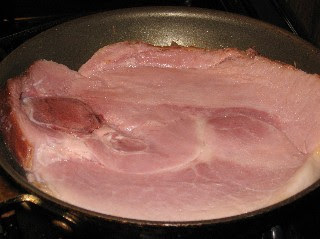 You can serve the ham cut up, use the extra syrup in the pan to drizzle over top. Add some mac & cheese on the side and you have a quick meal. This is a real quick meal. Terry & I have even made sandwiches with hamburger buns. Hope you enjoy! !